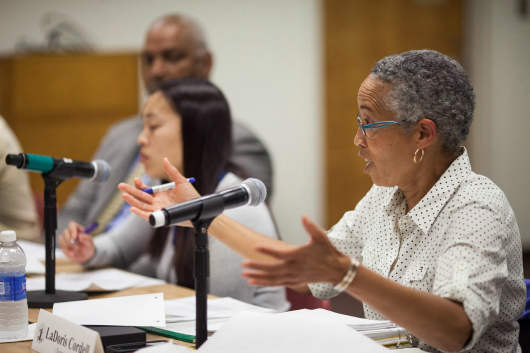 Judge LaDoris Cordell at the final task force meeting (James Tensuan photo). President Qayoumi emailed the following statement to all faculty, staff and students regarding alleged hate crimes in SJSU’s student housing complex. A website summarizing all relevant reports, updates and messages has been established. Last night, the Special Task Force on Racial Discrimination held its sixth and final meeting, which I attended. In appointing this task force, I asked for recommendations that would help ensure a safe, welcoming, inclusive climate for everyone in the SJSU community. It was important to me that the task force and its work be both independent and transparent, and that its membership reflect diverse constituencies and viewpoints. The task force met all of these objectives. All meetings were publicized and open to the public, and accessible to others via live webcast. All drafts of task force recommendations were posted and available for public review, as are the corrected final recommendations [PDF]. At Thursday’s meeting, I publicly thanked retired Judge LaDoris Cordell for serving as task force chair. She was the strong, focused leader we wanted. I also thanked each task force member for investing time and energy in this important effort. Their honest input has been crucial, and will help inform our future actions. The task force has offered more than 50 suggestions. In the aggregate, they reflect the diverse experiences and perspectives on this committee, as well as input offered by others. These recommendations deserve and will receive careful consideration and study. We will then develop an implementation timeline. There are no easy or quick fixes. I am committed to thoughtful, sustainable actions that will have the long-term impact we all desire. We will act in a timely manner, and we will report our progress both to our campus and the community at large.